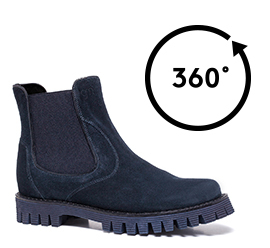 Trendy and cool, this elevator ankle boots handmade in Italy are able to add from 2.4 to 4 extra inches to your height. The upper is in soft blue suede calfskin while the tank thread outsole, in lightweight blue striped rubber 100% natural, cushioning and impact-resistant, allows greater walking stability even for those who wear the highest increasers. Can be matched with any type of outfit, from casual to formal.